But are you taking full advantage of your list? I see so many internet marketers that are building a list but are not engaging with their subscribers. If you are not emailing your list with affiliate offers, valuable content and useful tools. You are missing out on a major piece of the puzzle. Your list is your business… If you are not mailing your list, you are not generating sales and in turn, you are not earning commissions. Not sure what you should be mailing your list about? This is low price barrier product that is very easy to promote to any affiliate marketer or online entrepreneur. Your list should be very responsive to most list building products or service like this. I would love to have you as an affiliate! 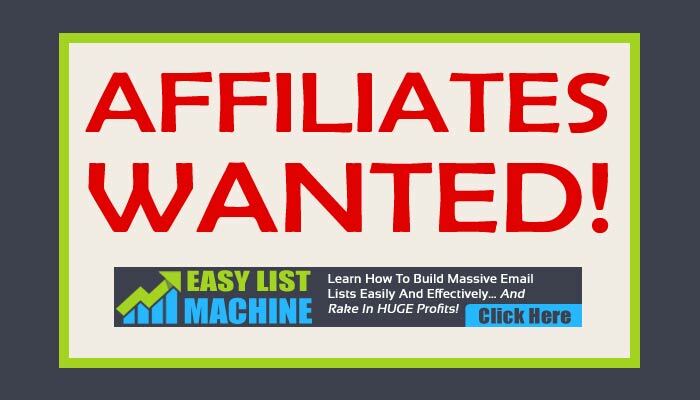 Check out this page for more information: Become An Easy List Machine Affiliate Today! Dont’ Wait… Take action today! Be the first to comment on "Affiliates Wanted!"